Kuchipudi - Indian classical dance form of Andhra Pradesh. Kuchipudi is the classical dance drama form that originated from a village called as Kuchelapuram in Krishna district of Andhra Pradesh. This dance drama includes rigorous movement of hand and foot and hence can be said as a perfect balance of Nritta (pure dance), Nrittya (dance with emotions) and Natya (drama). Kuchipudi evolved as a religious dance that was performed in temples and the theme for the dance was based on Lord Krishna. Initially the dance was performed by Brahmin men called as Bhaghavathalu, but now the dance is dominated by women and it has reduced to more like dance than like dance drama. Like other dance forms even Kuchipudi also has its roots in Natya Shastra. Natya Shastra has around 6000 verses and 36 chapters. It is a Sanskrit text based on performing arts. 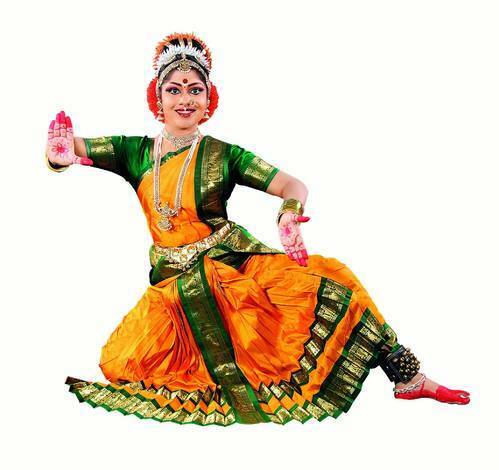 It is believed that kuchipudi was in existence around 10th century. Inscriptions written on copper called as Brahma melas are found and also found in the texts of Machupali Kaifat of 15th century. Kuchipudi saw a decline aound late 17th century and during colonial period. Most of the dance form declined during colonial rule. However during the beginning of 20th century with great efforts from Vedanta Lakishminarayana Sashtri, Vempati Venkatanarayana Sastri and Chinta Venkataramyya Kuchipudi saw a revival. The three encouraged people to learn Kuchipudi and also encouraged Indian women to perform solo dance of Kuchipudi. The dance starts with a prayer and is usually performed during evenings. The postures of Kuchipudi and Bharatanatyam are quiet similar such as the half setting position called as Aardhamandali. But however there is subtle difference between the two dances. Even kuchipudi follow three performance categories like Nritta, Nritya and Natyam. Nritta is a pure dance form where importance is given on form, speed and pattern. Nritya is slower body movements and expressions that try to keep audience engrossed in the dance and the theme of the dance. Natyam is the group performance but can also be a solo performance. Ones the prayer is done and the actors are introduced on the stage Nritta performance starts, later comes the Nritya which is the most important part of the dance. Nritta includes darus, Jattiswaram, tilanas, tirmanas. While nritya includes padams, varnams, slokas and shabdams. The costume of the dancer includes saree with pleats in front with lot of jewellery worn on head, hair, ear and neck. Lot of flowers are also worn on the head with lot of make up on the face. A ghungroo is also worn. The male dancers wear a dhoti from the waist to downwards called as Angavastra. A waist belt made up of gold or brass is worn by the dancers. A big bindi is kept on the forehead of the dancers. Some famous dancers include Yamini Reddy, Kausalya Reddy, Lakshmi Narayan Shastri and many more.